It is not easy to download music from YouTube and other websites due to some reasons. Have you ever dreamed applications which can help you directly grab music, and then transfer it to your iPhone or burn to a CD so that you can enjoy your favorite music anytime and anywhere? In this article, I will introduce you two easy apps to grab YouTube audio. YouTube Music Converter, a tiny but powerful app, can solve the problem easily. It can grab audio from YouTube with high fidelity. Instructions: You will see a textbox near the button “start” after you run it. Copy the video URL that you need, paste in the textbox, click “start”, this application will automatically grab mp3 off YouTube. (Actually, it applies to other websites, like yahoo music, Last.fm, Pandora, Grooveshark etc.). 1. Fast speed. As a professional device, the converting process will not keep you waiting long. 2. Search function. Type in keywords, then YouTube Music Converter will search for it. This function makes you find music more convenient. 3. Advanced Setting. Click button “Advanced”, here you can choose the output folder, the formats you need (including mp3, wma, m4a etc. ), the sample and bit rates. 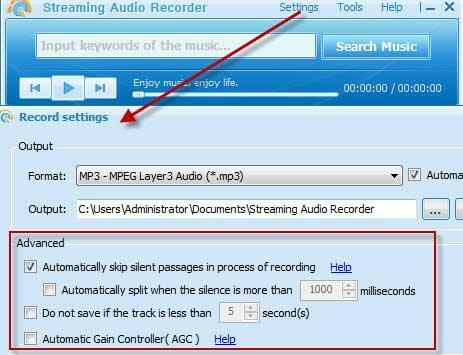 Streaming Audio Recorder is another option to grab music from YouTube. Different from YouTube Music Converter, this app can grab both the whole and a fraction of the audio. For example you can only capture a part of a song to as your ringtone. 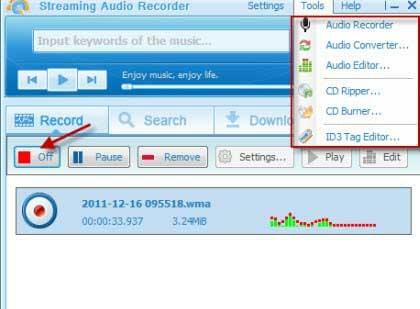 Besides, Streaming Audio Recorder solves the problem that wait for a long time when downloading an entire song or album. Concrete steps: Play the song on YouTube, the app can detect and record any sound rapidly. The music will be recorded with 1:1 quality. But make sure you click the button “on” before you start to play the song so that you can get the entire song. When the audio is finished, click button “off”. That’s all. Moreover, this YouTube audio grabber contains other functions. Click the button “tools” you can see clearly. Audio converter: The grabbed audio can be converted to formats like MP3, AAC, WMA, WAV and OGG. Audio editor: Here you can edit the grabbed audio by appending, inserting or mixing sound file. This function will help to make a better effect. CD Ripper: Rip music from CDs, you can keep the music forever in case the CD scratch or miss. CD Burner: Burn your favorite music to a CD, so you can enjoy it while you are driving or doing housework. Silence skipping: Click the button “setting”, and enter in record setting, here you can skip the silent parts of the audio if you don’t want. ID3 tag editor: This allows you to edit the information of the grabbed audio like title, artist, album and year. Create schedule task: For example, you happen to be not available during an interesting live music plays, then this function can sever for you. Just set the start time and duration, this app will automatically get mp3 from YouTube. So many great features, why not try this YouTube audio grabber yourself now? Apart from audio, if the video of the music is also what you need. Here YouTube Download Suite meets your need. Rating: 4.3 / 5 (based on 12 ratings) Thanks for your rating!